NADiff Gallery: Hideki Nakazawa Exhibition "Source and Execution"
This is Hideki Nakazawa's unofficial English website translated from the official website. Hideki Nakazawa Exhibition "Source and Execution"
NADiff Gallery is proud of holding Hideki Nakazawa's Exhibition "Source and Execution." In this exhibition the web works from the series "Source and Execution," appeared in the email bulletin "New-Method" from 2010 to 2012, will be overviewed all at once. 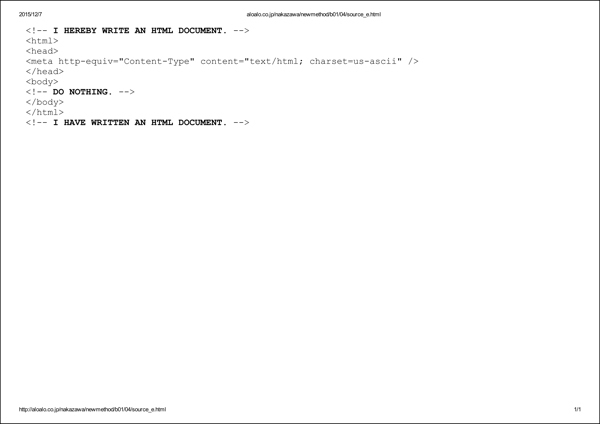 The "source" of the "Source and Execution" means a document that gives a series of instructions to the computer, in this work have been used a source written in a language called HTML, which has been developed for the web pages. When we try to open a web site in a browser, web page will be displayed by computer's "executing" the instructions written on the source. Nakazawa then considered the invisible "source" itself to be more important and essential than the visible web page that we see as a result of the "execution." In other words, concept is the very artwork. Thus, 85 works as a whole series of "Source and Execution" have been produced together juxtaposing the HTML document, "source," and its display on the brouser, "execution." By the way in the exhibition of Award-winning Works of the 19th Japan Media Arts Festival whose period will overlap with Nakazawa's exhibition, the Grand Prize work of Art Division "50 . Shades of Grey" by Chung Waiching Bryan will be exhibited at National Art Center. This work also presents the source of computer programming as artwork. Nakazawa was a juror of the award, admired at this entry based on kind of similar thought to his own work and become one of the recommenders of this work. In Nakazawa's exhibition carried out in NADiff Gallery, you will be sure to witness the manifestation of the universality of beauty by common ideas beyond the age and nationality. Nakazawa started his activities as an artist from student days and repeated the style transition till today. After the graduation from the Medical Dept. of Chiba University and following some years as oculist work, he became an illustrator in 1990 and was popular for "Baka CG" (Silly CG), Japan's first Heta-Uma (unskilled good) computer graphics. However, having invented and applied for patents for 3D bitmap related materials in 1996, he converted to fine art and titled himself artist in 1997, pursuiting and producing stoic "Method Painting," the pixels of which being symbols such as characters and Go-stones. In 2005 when the activity of Methodicism ended he called his less stoic new style "Serious Painting." In 2010, he presented "New-Methodicist Manifesto" with Takahiro Hirama and Shogo Baba and published email bulletin "New-Method." Other various activities followed afterward. Art shop NADiff a/p/a/r/t will also feature his writings as art history book such as "Art History: Japan 1945-2014" (Art Diver, 2014), "Textbook of Modern Art History" (Tom's Box, 1989), "Lives of Western Painters" (NTT Publishing, 2001) and others, introducing Nakazawa's amplitude of theories and artworks appeared at the topos of crossing the wide-ranged but consistent thought in history and art. "Method Painting Small Exhibition" will be also held at NADiff Window Gallery located at the entrance of the ground floor of NADiff A/P/A/R/T at the same period, series of talk sessions and performance events will be held as well which will extend the understanding of the exhibition and the exhibits. We will be very glad if you can join us. or signified and signifiant (Saussure). the topic of idea and material. or patent and its output in Art Patent. Small works including the series of "Tile Painting," "Rising to the Right," "Money" and others. 17:00 - 19:00 on February 11 [Thu/Holiday], 2016. * Reception Party will follow. 15:00 - 19:00 on February 20 [Sat], 2016. Some of the "Source" are written within 1 page, while some of others being over 400 pages. The "Execution" is interactive and the screen display will differ every time. Let's tour with the artist viewing all the 85 works spending 4 hours. 17:00 - 19:00 on March 6 [Sun], 2016. 15:00 - 17:00 on March 21 [Mon/Holiday], 2016. Nakazawa's activity of writing which belongs to the category of reflection of his idea of art will be talked focussing his past books including "Art History: Japan 1945-2014," "Texetbook of Modern Art History," "Lives of Western Painters" and others. His new anthology, the publication of which was postponed, will be mentioned as well. Furthermore, Mr. Shigeo Chiba, art critic will join the latter half of the talk. The dialogue may cover the exhibition "Source and Execution," views of contemporary art history, and other various extended themes. * Autograph session will follow after the talk. Please book via phone or email as follows. Make sure to include the event title in the email. Yebisu International Festival for Art & Alternative Visions 2016 "Garden in Movement"
Venues: The Garden Hall, The Gardwn Room, STUDIO 38, Center Square of Yebisu Garden Place, Yebisu Garden Cinema, Auditorium and Gallery of the Maison Franco-Japonaise , Related cultural facillities, galleries, etc. Hideki Nakazawa will give a speech in the Yebisu International Festival. Topic on Hideki Nakazawa Exhibition "Source and Execution" undergoing at NADiff Gallery will be introduced with Nakazawa's recent works also. Venues: National Art Center (Roppongi, Tokyo), etc. Hideki Nakazawa was a juror for the Art Division and the talk with the Grand Prize winner Chung Waiching Bryan will be held from 18:30 on February 5. Takaaki Yamamoto, panelist for the opening talk, won the New Face Award and his demonstrations will be took place from 11:00 and 14:00 on February 13 and 14 each in addition to his exhibition. Hideki Nakazawa is a male artist born in 1963 in Niigata Prefecture, Japan. While studying at the medical department of Chiba University in 1983, he started his activities as an artist (his first period, acrylic painting). In 1990, he changed careers from an oculist to illustrator. He underwent his second period, "Baka [Silly] CG," by replacing paintbrushes with a computer mouse. 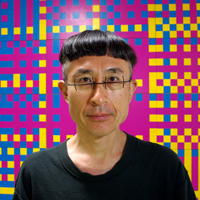 In 1997, he converted to fine art by replacing computer graphic pixels with symbols such as letters (the third period, "Method painting"). He resumed the use of colors in 2004, commencing the fourth period, honkaku [serious] painting, "New-Method," "Forth Expressionism" and others. He has written "Methodicist Manifesto" and "New-Methodicist Manifesto." As named in official patent records, Nakazawa is the inventor of "Voxel Data Processing Using Attributes Thereof," and "Solid Object Generation." He has published three books; "Textbook of Modern Art History, The Lives of Western Painters," and "Art History: Japan 1945-2014." His music release is titled, "Nakazawa Hideki Music Works." He won the MMA Artist Prize at Multimedia Grand Prix '95 and the Encouragement Prize at VOCA 2003. He was a juror for the 19th Japan Media Arts Festival. * Notice: New book publication was postponed. The already announced new book publication of Hideki Nakazawa's anthology was postponed and there is no hope for its release during the exhibition period. Sorry from the artist for the change of already announced information to those who longed the publishment.